Now in its 3rd year of touring to sell-out crowds nationwide, the hugely popular Stars of Irish Country Show returns for another night of toe-tapping and hand clapping Country Magic! 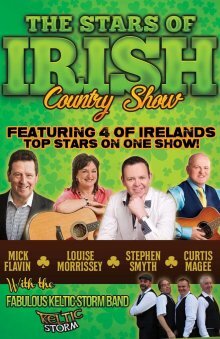 This years line-up features four of Ireland’s top Stars Mick Flavin, Louise Morrisey, Stephen Smyth and Curtis Magee who between have notched up over 30 No.1 hit songs and have played to legions of fans all across the UK and Ireland through careers that span over decades. Each Stars will perform their biggest hit songs in the company of the fabulous Keltic Storm Band who create that authentic Country Sound. One things for sure, if its Country music you like then this is the show for you!